5 - 10 working days Ordered. This product has been ordered from our provider and will be available in 5 - 10 working days. Order now to make sure the product will be reserved for you. Suunto Spartan Ultra is an advanced multisport GPS watch sporting a color touch screen, 100m (300ft) water resistance and up to 26h of battery life in training mode. Compass & barometric altitude with FusedAlti™ ensure you always stay on course. With 80 pre-set sport modes and rich sport specific metrics Spartan Ultra is your ultimate training partner. Follow your progress with personal bests and train smarter with community training insights. 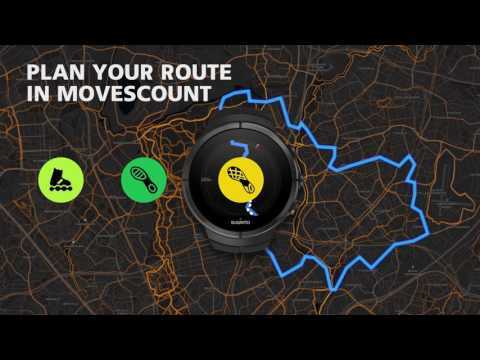 Discover new routes on Suunto Movescount using heatmaps and let the watch route navigation guide you. Spartan Ultra watches are hand-made in Finland and built to last in any conditions. Measurements: 1.97 x 1.97 x 0.67 "
Ordered. This product has been ordered from our provider and will be available in 5 - 10 working days. Order now to make sure the product will be reserved for you. The Warranty Period is one (1) year for accessories including but not limited to wireless sensors, chargers, cables, rechargeable batteries, straps, bracelets and hoses. Suunto was founded in 1936 by outdoors man and a keen orienteering enthusiast Tuomas Vohlonen, who had long been bothered by a problem: the inaccuracy of traditional dry compasses and their lack of steady needle operation. Today, Suunto is a leading designer and manufacturer of sports instruments for training, diving, mountaineering, hiking, skiing, sailing and golf..
Prized for their design, accuracy and dependability, Suunto sports instruments combine the aesthetics and functionality of watches with sport-specific computers that help athletes at all levels analyze and improve performance. Headquartered in Vantaa, Finland, , Suunto employs more than 500 people worldwide and distributes its products to over 100 countries. If you have a credit card that allows you to purchase in internet, and you have a code or password that allows you to pay on-line, this is a good and comfortbale way to pay for you. Payment on-line means that your order will be paid for right after checkout, and is therefore very fast. fitnessdigital.cz is 100% secure. We guarantee the safety of your credit card information. All credit card information is handled with the utmost security and will never be released to any other organisation under any circumstance.